SanDisk has developed a chip that earns it membership in the exclusive 128-gigabit club. Not content with simply matching the Micron / Intel effort, SanDisk and its partner Toshiba claim their new memory uses 19- rather than 20-nanometer cells in the production process. While the shrink in size is a great thing, SanDisk's new chips also use its X3 / three-bit technology. If you didn't know, most memory stores just two bits per cell Cramming in another means fewer cells, less silicon, more savings, cheaper memory, and naturally happier geeks. Analyst Jim Handy estimates that the price per gigabyte for the tri-bit breed of flash could be as low as 28 cents, compared to 35 for the Micron / Intel equivalent. And here is a very not so compact press release to cover the rest of the info. MILPITAS, Calif, Feb. 22, 2012 - SanDisk Corporation (NASDAQ: SNDK), a global leader in flash memory storage solutions, today announced it has developed the world's smallest 128 gigabit (Gb)* NAND flash memory chip currently in production. 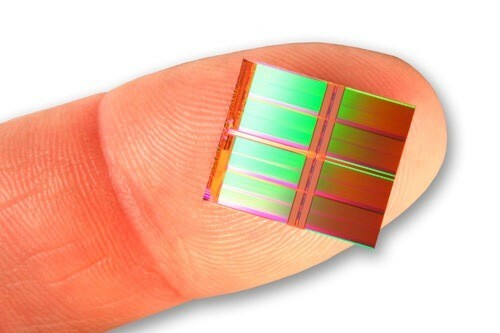 The semiconductor device can store 128 billion individual bits of information on a single silicon die 170mm2 in size - a little more than a quarter of an inch squared, or smaller than the area covered by a U.S. penny. The use of NAND flash memory in high tech equipment like smartphones, tablets and solid state drives (SSDs) allows advances in the full function, small form factor devices that are highly valued by consumers. Shrinking the size of NAND flash memory allows smaller, more powerful computing, communications and consumer electronics devices to be built while keeping costs low. SanDisk built the 128Gb NAND flash memory chip on the company's industry-leading 19 nanometer (nm) process technology. A nanometer measures one-billionth of a meter, meaning that 19nm circuit lines are so small that about 3,000 of them could fit across the width of a human hair. The chip also employs SanDisk's three-bit per cell (X3) technology that allows the company to build NAND flash memory products with the ability to read and write three bits of information in each memory cell. At 19nm, SanDisk is deploying its ninth generation of multi-level cell (MLC) NAND products and fifth generation of X3 technology. This combination of manufacturing and technical expertise helps SanDisk pack more information into each memory cell making it possible to create a smaller, denser NAND flash memory chip. In addition to reduced size, the 128Gb semiconductor device has an industry-leading X3 write performance of 18 megabytes (MB)** per second. This level of performance is achieved using SanDisk's patented advanced all bit line (ABL) architecture and means that X3 technology could be extended to certain product categories that use MLC NAND flash memory. A technical paper outlining the breakthrough will be presented at the International Solid-State Circuits Conference (ISSCC) in San Francisco today. The 128Gb NAND flash memory chip was developed jointly by teams from SanDisk and Toshiba at SanDisk's Milpitas campus. The effort was led by Yan Li, director of Memory Design at SanDisk. Products based on the 128Gb three-bit per cell technology began shipping late last year and have already started to ramp into high volume production. SanDisk has also developed a derivative product based on the success of the 128Gb chip - a 64Gb, X3 NAND flash memory chip that is compatible with the industry-standard microSD™ format. The company has also started to ramp production of this additional chip technology. NAND flash memory is the technology behind the high reliability, small form factor storage solutions that SanDisk sells to OEM customers for use in a wide variety of products such as smartphones, tablets and Ultrabooks. It is also the technology used in products SanDisk sells through its retail channel in the form of imaging and mobile cards, USB drives and mp3 players.